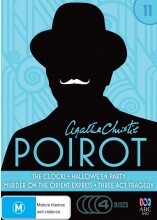 Agatha Christie's Poirot Series 11 DVD from DVDLand. Hercule Poirot, the world's greatest detective, nest-ce pas?Enigmatic, eccentric and extremely intelligent, Hercule Poirot cracks the toughest cases with brainpower alone - endearing himself to thinkers everywhere. Epitomising Agatha Christie's Poirot, David Suchet stars as the dapper and debonair Belgian detective with an eye for deadly detail, outsmarting both the criminals and his cohorts in and around elegant upper-crust London.Titles include: The Clocks, Hallowe'en Party, Murder On The Orient Express, Three Act Tragedy. The Clocks DVD: A corpse is discovered surrounded by four clocks, all set for 13 minutes past four. Halloween Party DVD: A young girl boasts of having witnessed a murder and is later found drowned in the apple-bobbing bucket. Murder On The Orient Express DVD: Poirot investigates the murder of a shady businessman stabbed on the Orient Express. Three Act Tragedy DVD: Poirot and actor Sir Charles Cartwright follow the trailer of a prisoner, after the local Reverend chokes on a cocktail. Click the button below to add the POIROT (AGATHA CHRISTIE'S) - COMPLETE SERIES 11 to your wish list.